If there wasn’t already enough controversy about the blue clay of the Mutua Madrid Open that just ended, Serena Williams had to get the spotlight back on her. Now, I’m no stranger to Serena being over the top, take for example, the US Open (2009 and 2011), criticizing her colleagues, and a handful of other incidents that are “palm-to-face-worthy.” This just takes the cake. Just the arrogance alone is shameful, but to criticize the entire ATP because of two players who spoke up about how they felt about a tournament. Don’t get me wrong, I think that Nadal and Djokovic boycotting the Mutua Madrid in 2013 is lame, though they are only speaking for themselves and not the rest of the ATP. Though there is no place for Serena to compare herself to the rest of men’s tennis. I will give Serena that women carrying and giving birth is about the most painful, natural thing I can imagine anybody doing, and we males have not the slightest clue what it feels like, and I agree that does make women tough as nails. To have Williams to say that, without actually having experiencing giving birth herself, holds no weight at all. I would like to see just how tough Serena Williams is after playing a full calendar of tennis, like the rest of the WTA not just “selected” events, maybe even throw in the four majors as best of 5 sets instead of 3. 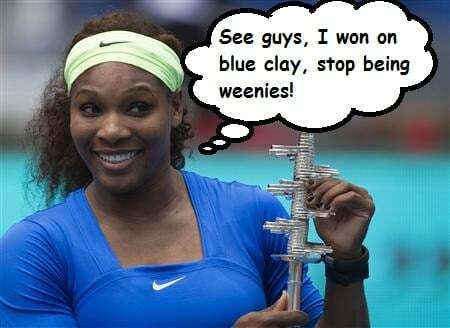 Including Indian Wells, since the two ‘weenies’ do play that every year…it’s been what? 11 years since you’ve shown up there Serena? I’m quite annoyed with the these words coming from a part time WTA touring professional.